I HAD a very distinct idea of the calibre of artist I wanted to speak to when I started my researches back in the 1970s. Each had to be steeped in music hall and variety and also somehow be living their last years in a kind of bubble, out of their time – not really seen as suitable for television, except perhaps as character actors for the more adaptable. They were stage people, music hall people, and they operated in a quite different world. That ruled out performers who, although of the same or similar vintage, had adapted well to new media and flourished happily on television or radio – Charlie Chester, Arthur Askey, Jimmy Jewel, Hylda Baker, Ted Ray and various others. I was more interested in the old-timers still trundling around Britain appearing in Old Time Music Hall shows. There were a couple of acts I would dearly have loved to interview, however, but it never happened. 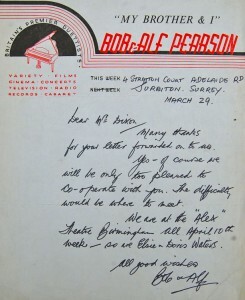 Bob And Alf Pearson agreed to see me but for one reason or another we were never in the right place at the right time. 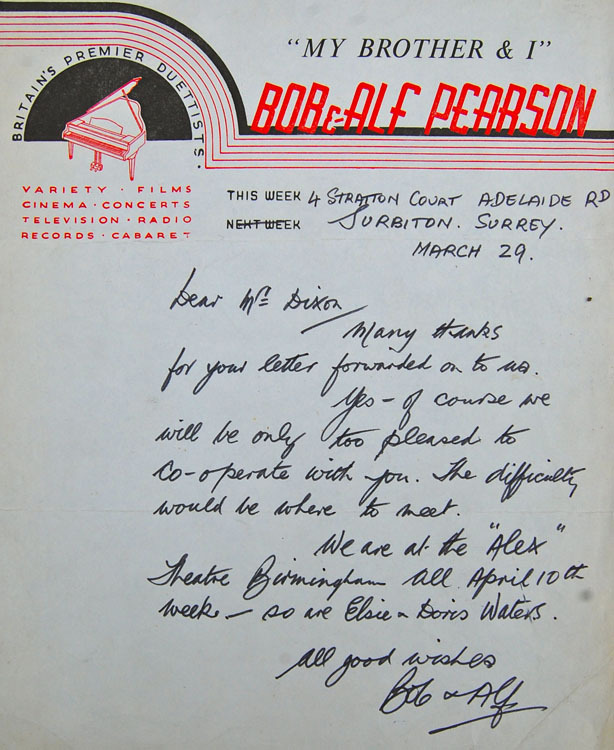 Bob (1907-1985) and Alf (1910-2002) were Sunderland-born duettists, Bob at the piano and Alf leaning against it, of sentimental or comic songs. 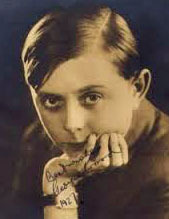 The other was ‘Wee’ Georgie Wood (1894-1979), the famous ‘little person’ of the music halls, who was 4ft 9ins and played a child for most of his long career. He agreed to see me all right, but demanded a fee for the interview, which was against the policy of The Guardian and, as all these interviews were carried out under the auspices of that newspaper, ruled him out. Looking back, I regret not doing the interview anyway and secretly slipping him a fee, because he was a fascinating character. But I was very young back then, and very hard-up. Share the post "The Ones That Got Away"